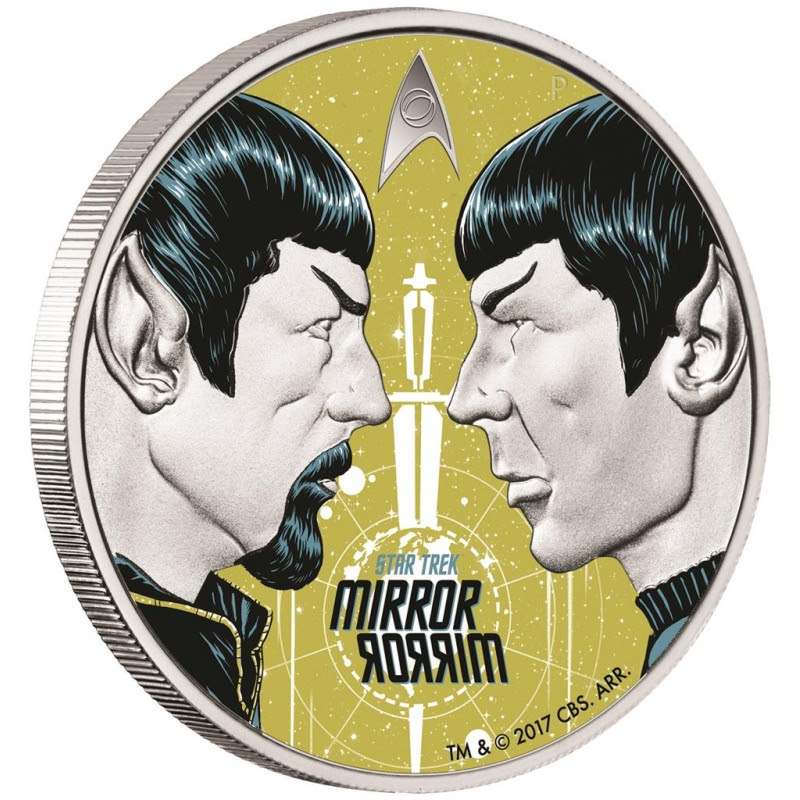 Notes: This is the first non-captain character design in the series so far, released in tribute to the then recently departed Leonard Nimoy. 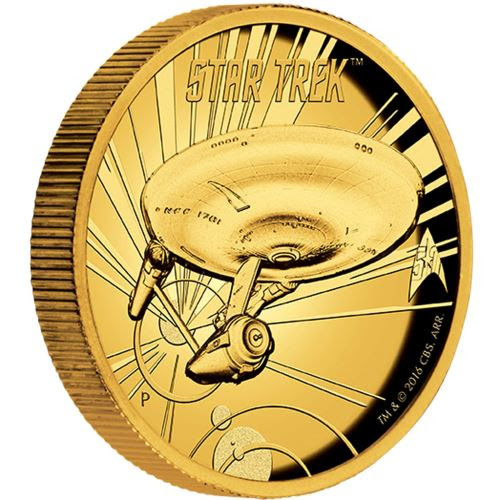 Additionally this coin was reissued later in bronze, as part of a coin and stamp set. 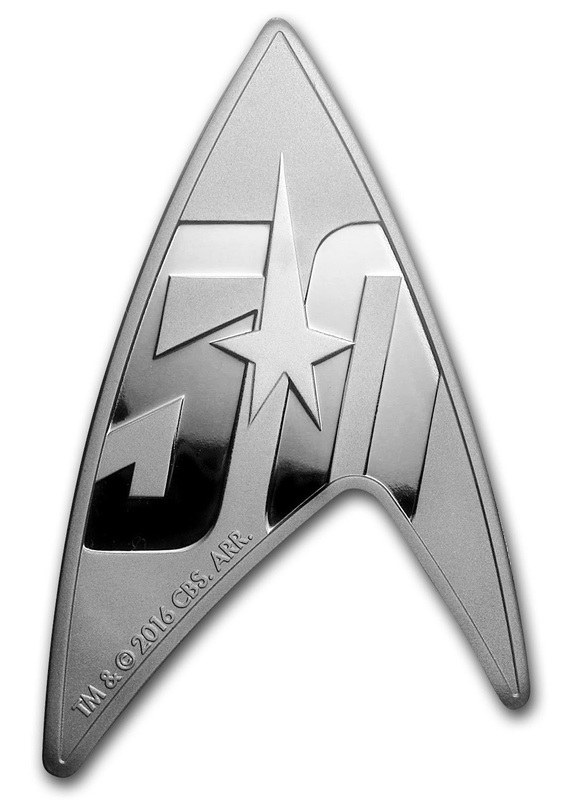 Edition: 5000 (silver). 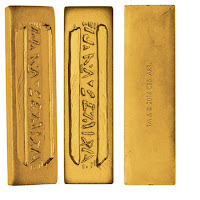 7000 stamp and coin set (bronze). 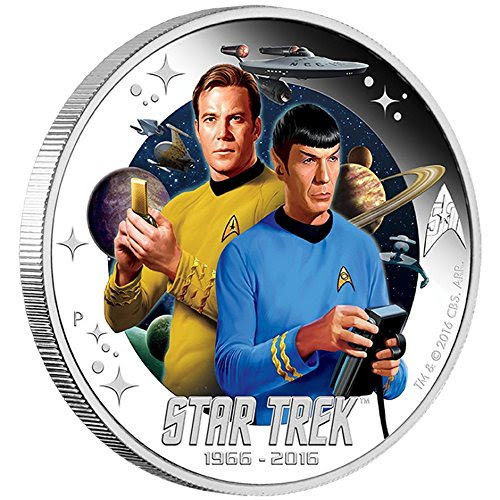 Release date: August 2015 (silver), May 2016 (stamp and coin set). Stamp and coin set: Amazon. 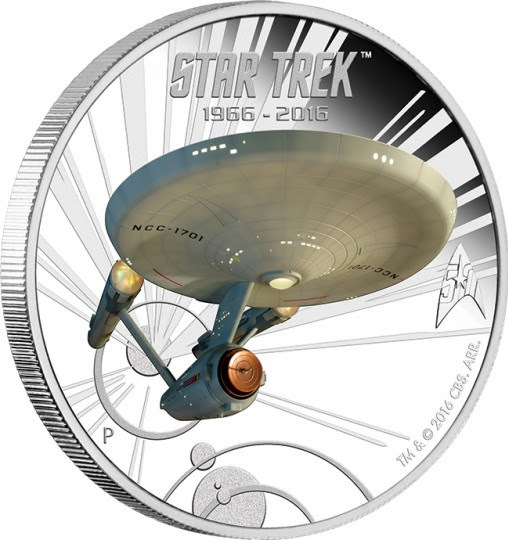 Notes: An unusual release, a prop reproduction rather than coin. 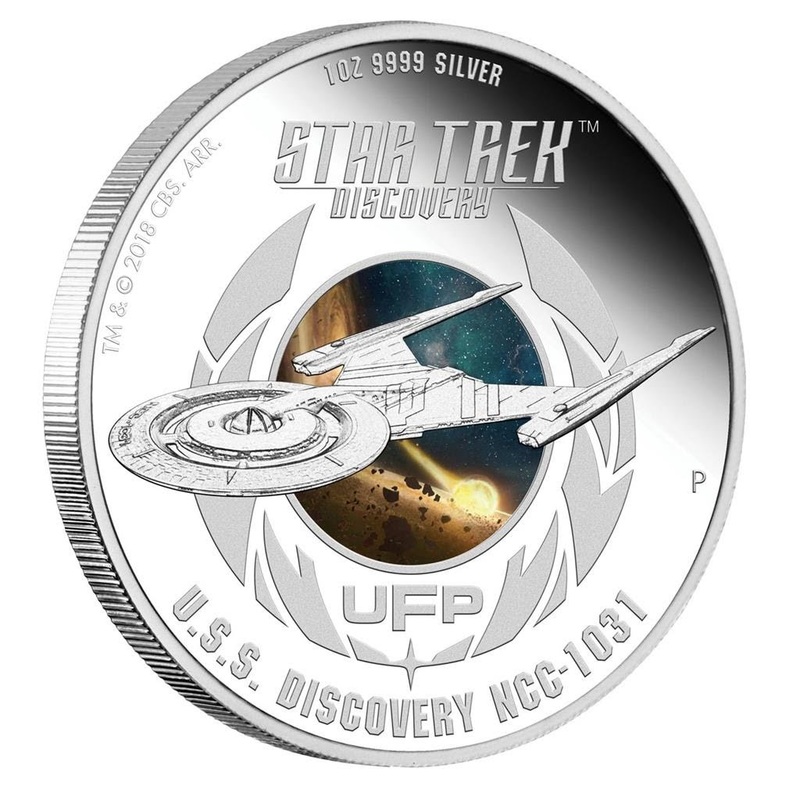 Material: One ounce silver, gold plated. 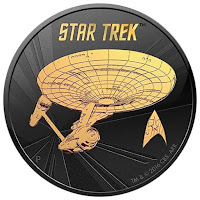 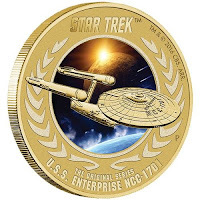 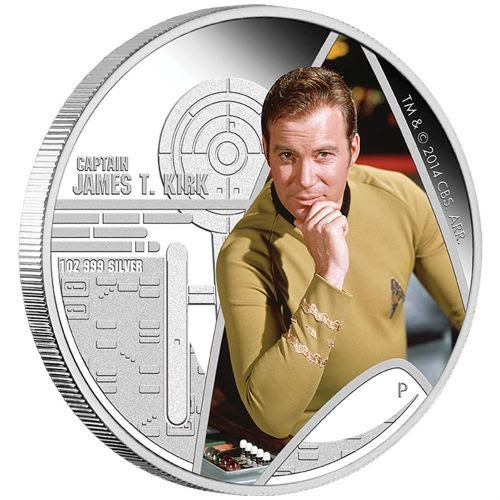 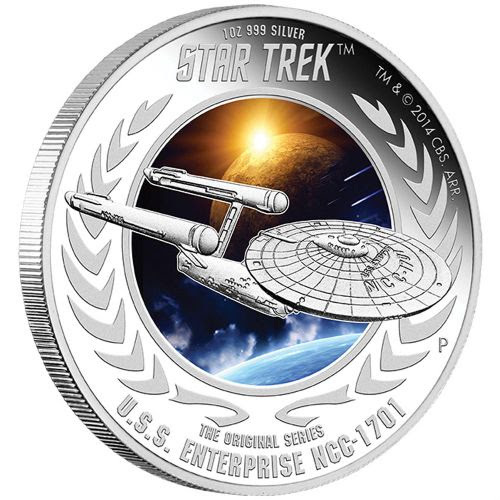 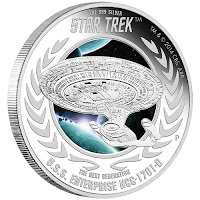 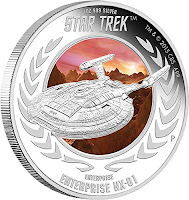 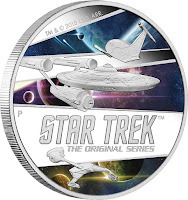 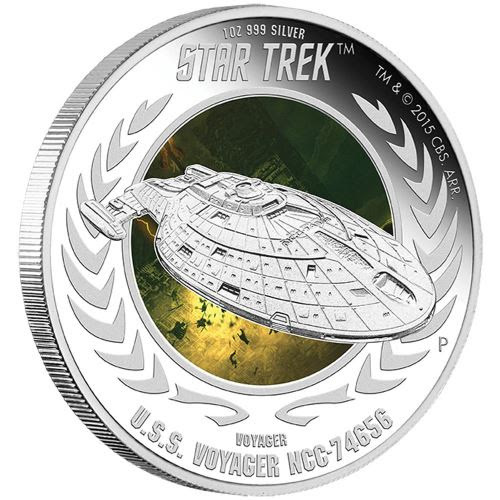 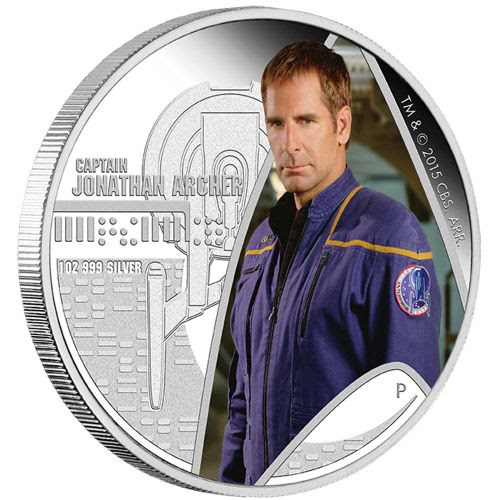 Notes: Low relief version of the same design as the USS Enterprise coin above, offered in a variety of sizes and materials. 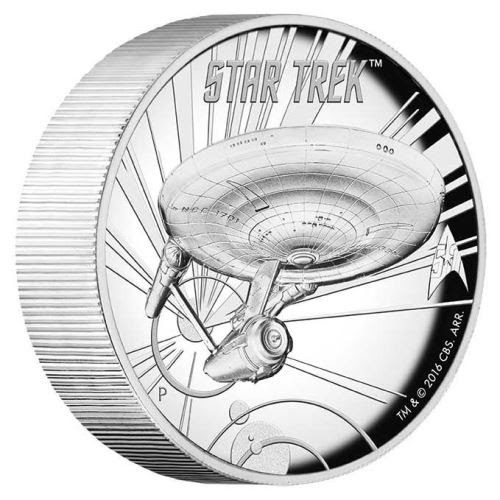 Edition: 6000 (1oz silver), 800 (5oz silver), 400 (1oz gold), 500 (ruthenium/gold plated). 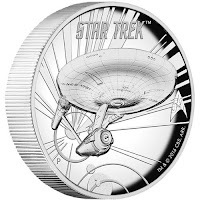 Material: One ounce silver, five ounce silver, one ounce gold, or one ounce silver with ruthenium and gold plating. 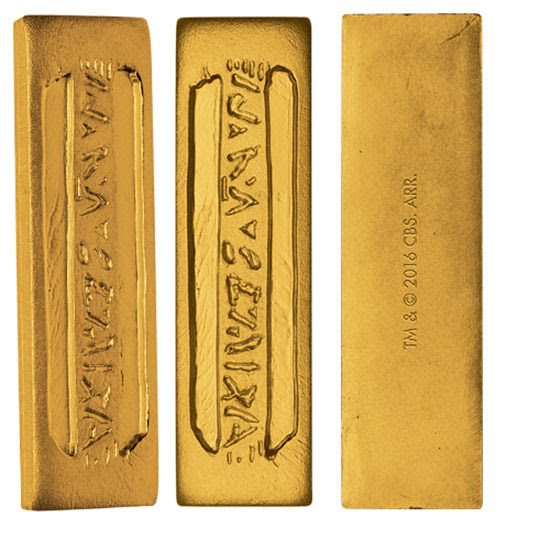 Face value: One Tuvalu dollar (1oz silver), eight Tuvalu dollars (5oz silver), or one-hundred Tuvalu dollars (gold). 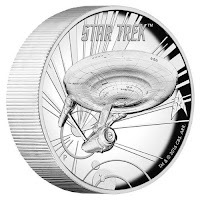 Notes: This uniquely shaped coin came packaged in acrylic display case. Notes: The first two ounce coin in the collection. 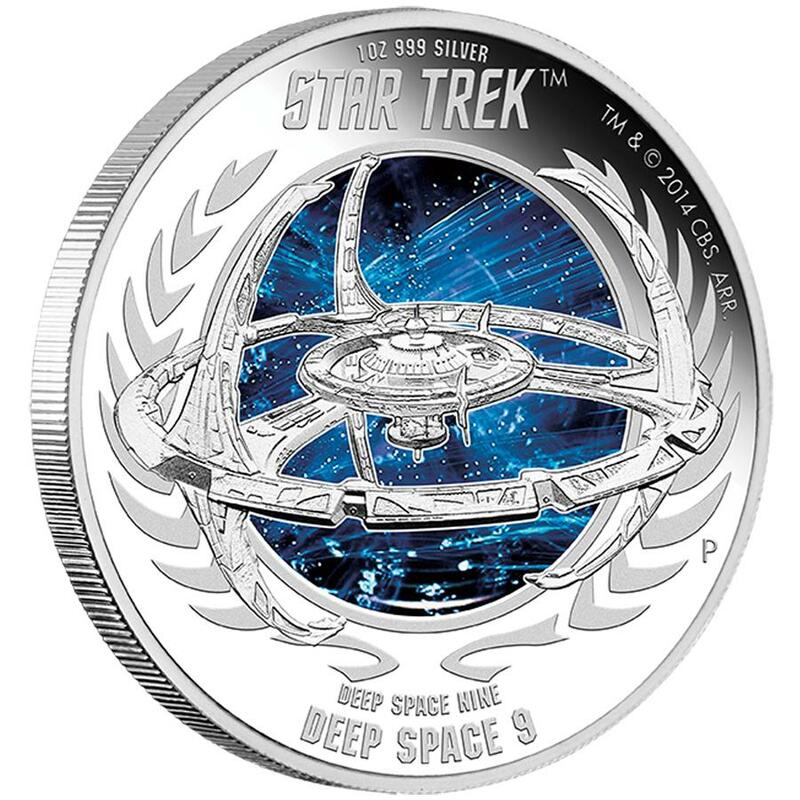 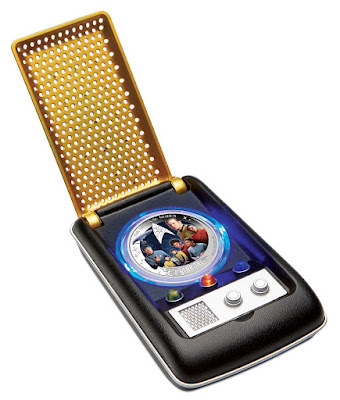 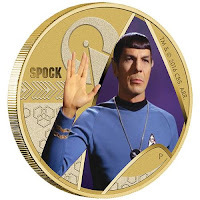 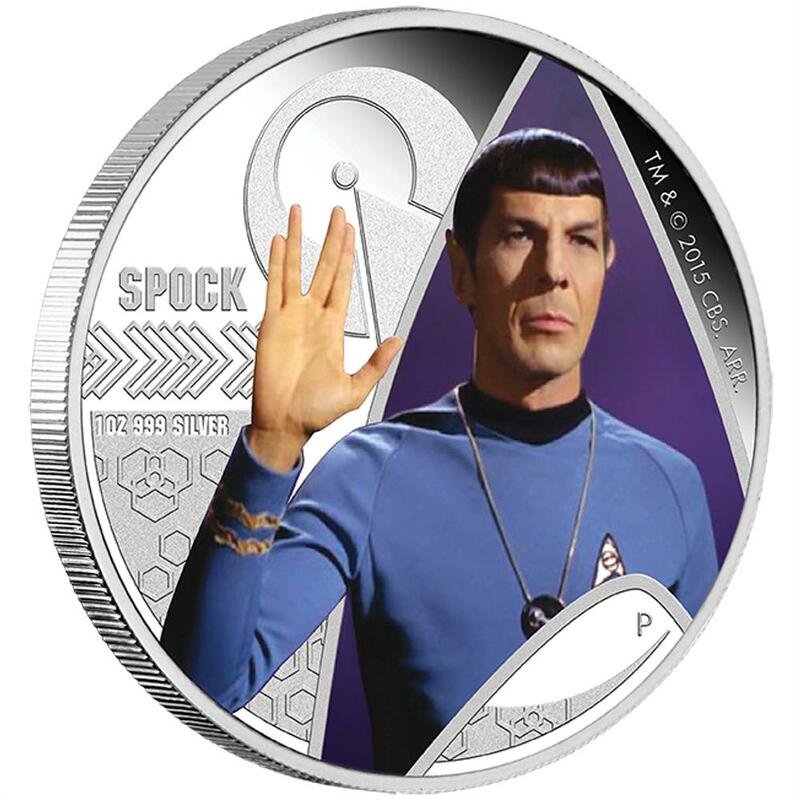 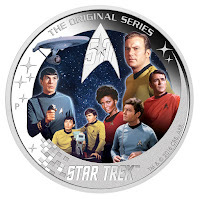 The coin came in unique packaging based on the TOS communicator. Face value: Two Tuvalu dollars. Notes: First episode specific coin in the series. Notes: This coin comes in the usual display case, but the light source is Borg-green instead of the usual blue. 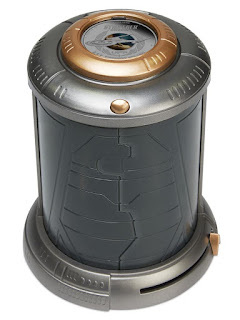 The case is also a metallic grey colour rather than the previously used white. 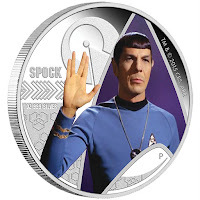 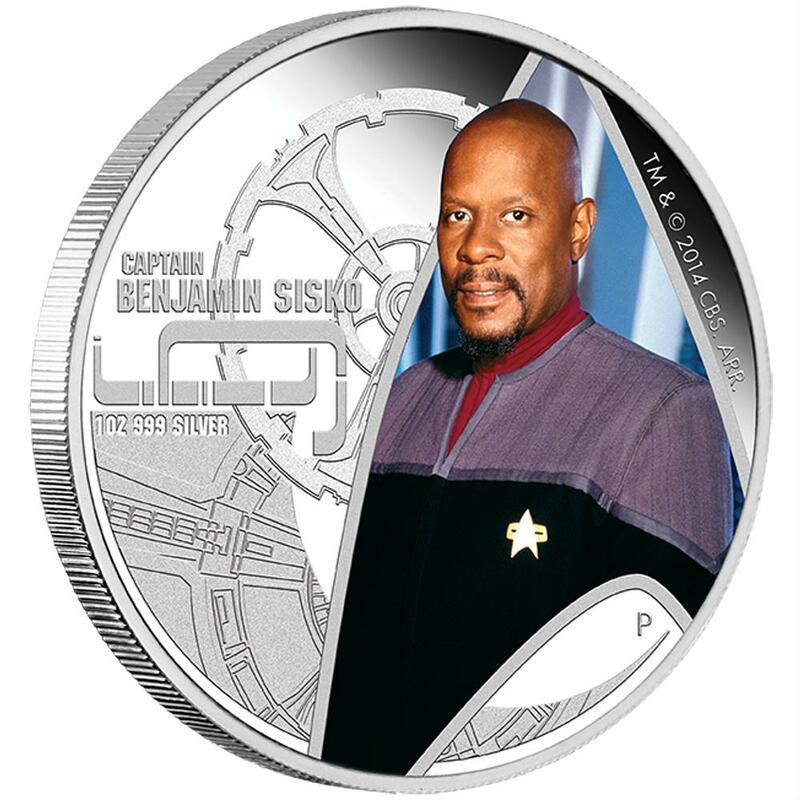 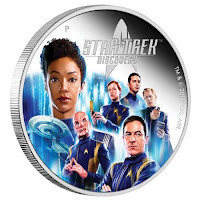 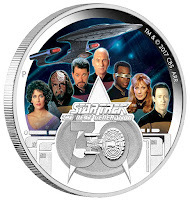 Notes: This coin comes in the metallic grey version of the usual display case, but the light source is Klingon inspired red instead of the usual blue. 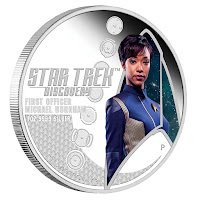 Notes: The two-coin packaging is reused for this release, but recoloured in more Discovery-style metallics. Perth Mint report the same mintages for this release, suggesting the coins will be available individually, but so far only two-packs seem to have been released. 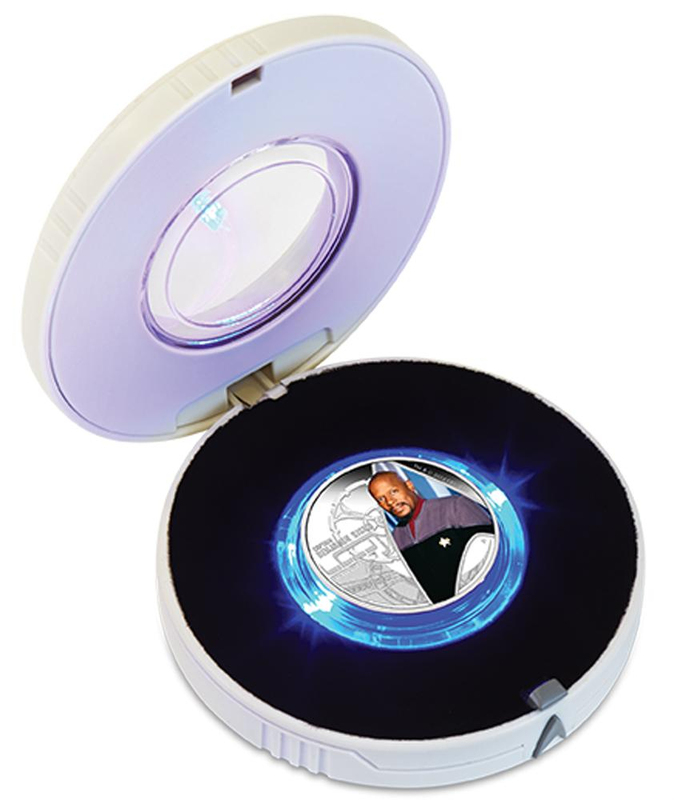 Face value: One Tuvalu dollars. 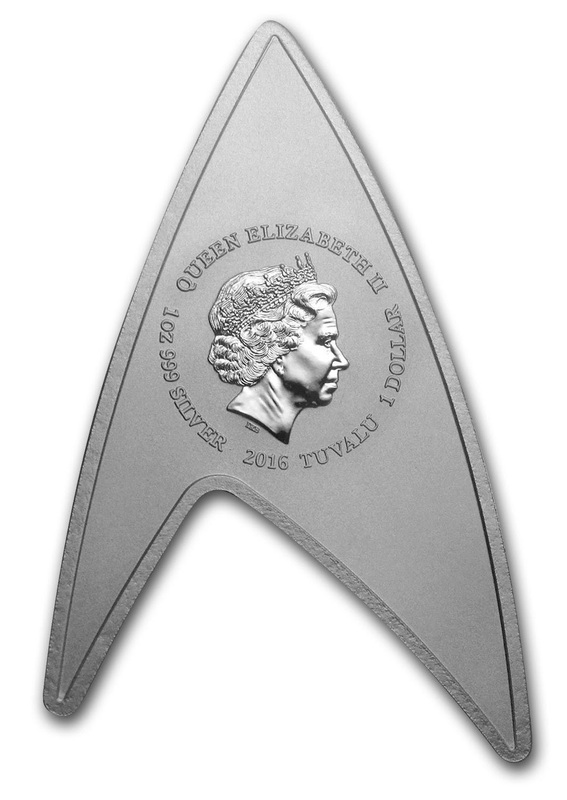 All the joins feature the same reverse design, the head of Queen Elizabeth II, and details of the origin and face value. 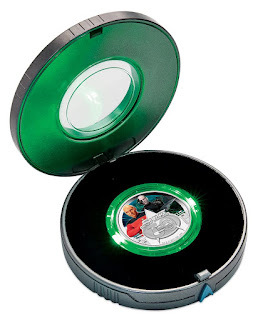 Individual coins are supplied in a case with an illuminated ring around the coin. The case can be opened using the delta shaped button at the front. 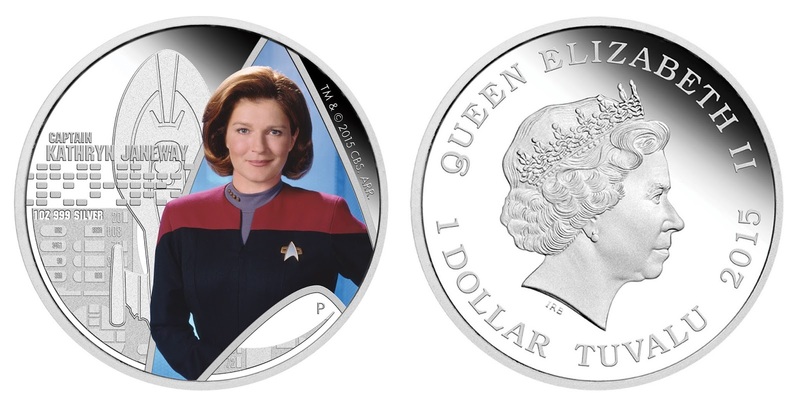 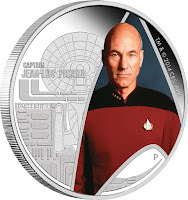 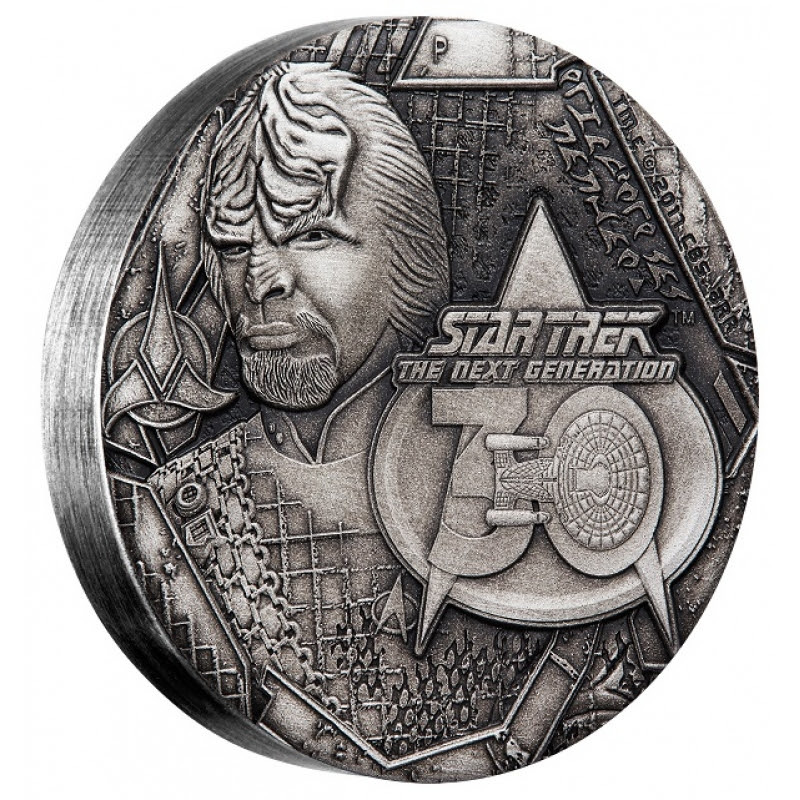 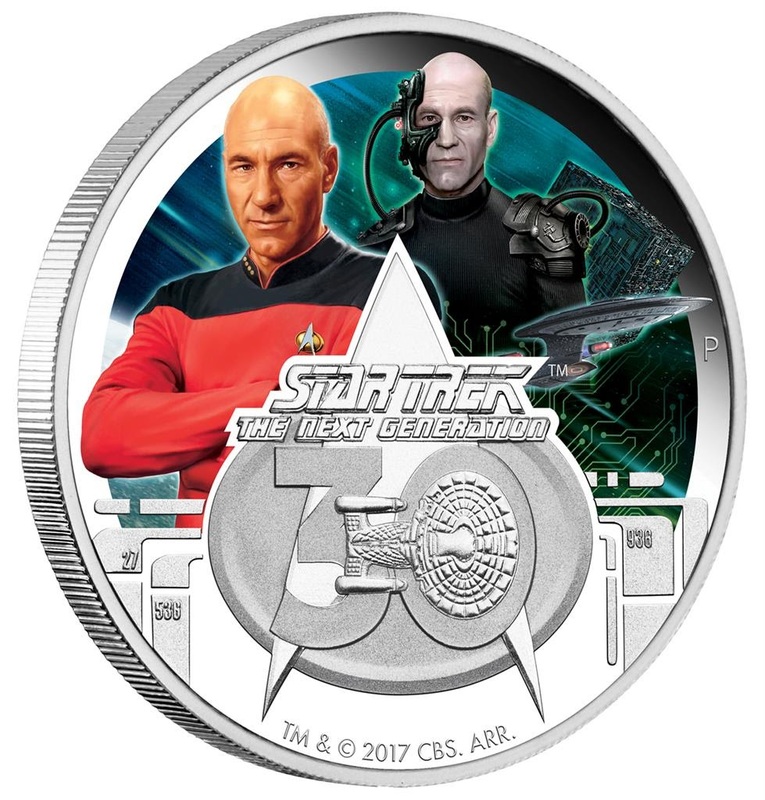 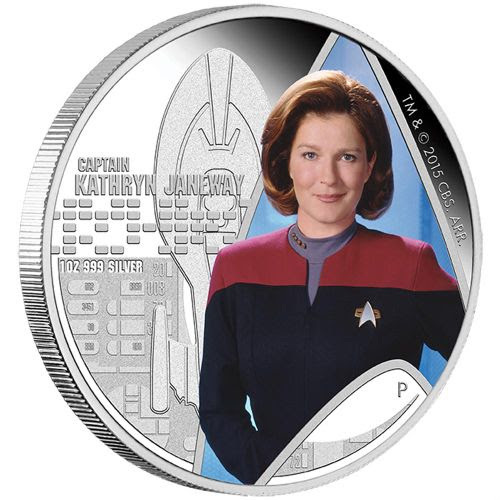 Most of these cases are white, but the three TNG coins released in 2017 came in metallic grey versions. The Borg themed coin uses a green light instead of the usual blue, and the Worf coins has a red light. 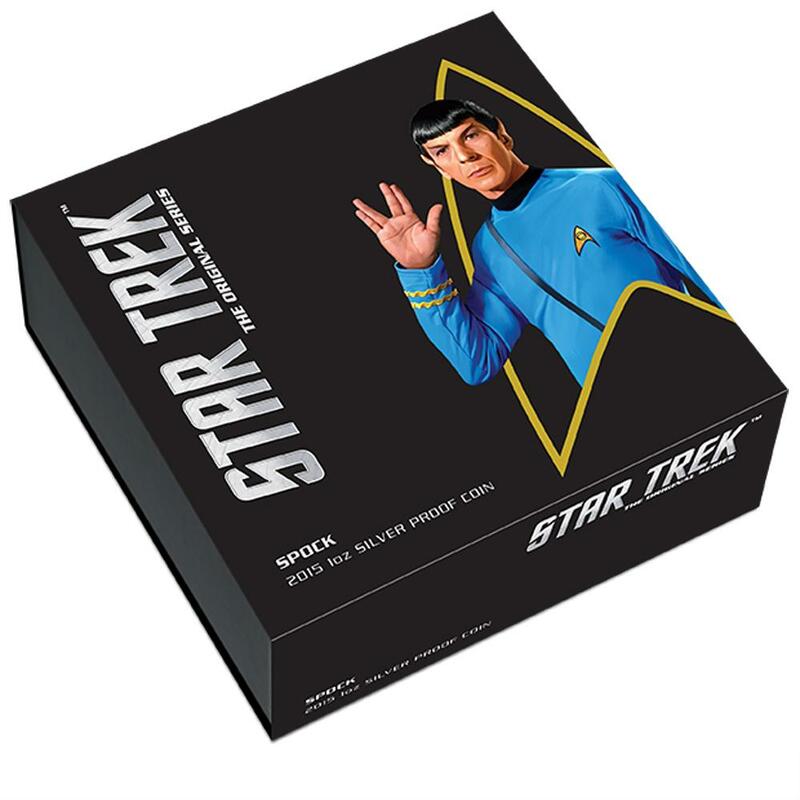 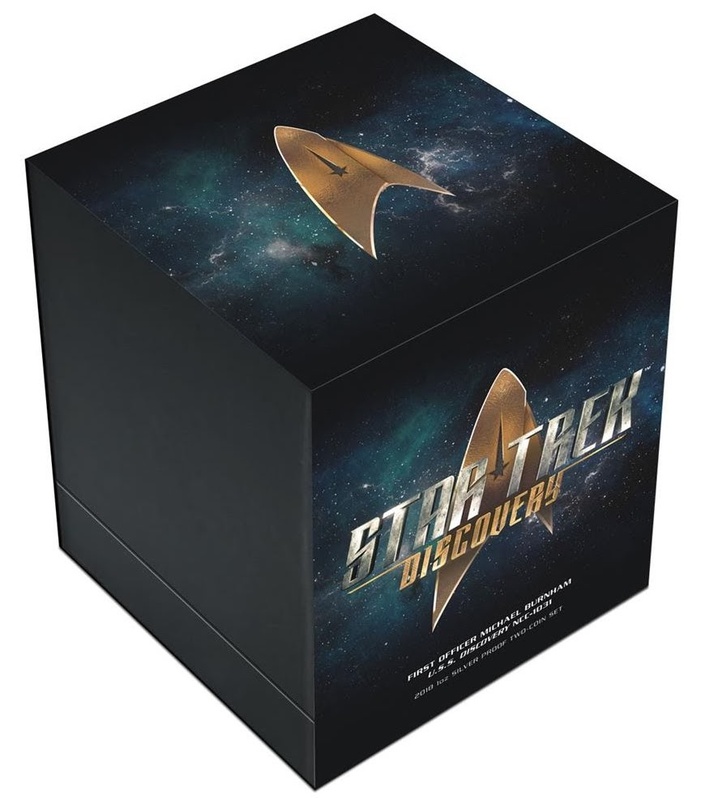 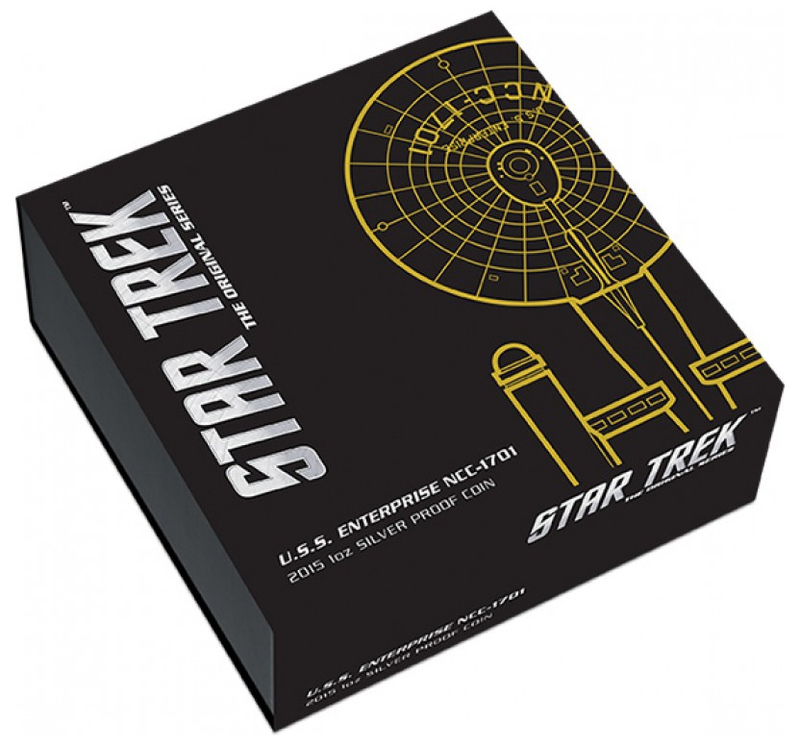 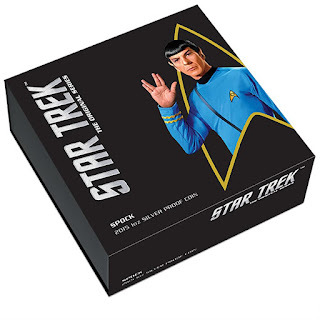 The cases themselves come packaged in a square box, using the standard Star Trek packaging of the period for higher end products - As this is one of the few ranges to include all five prime TV series since the introduction of this style of packaging it is a rare example of its usage for the series with less merchandise. 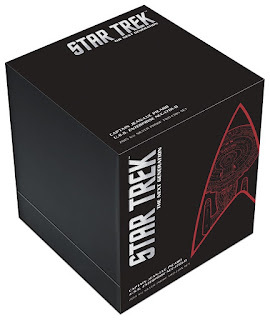 The ship design boxes feature a section of schematic, while the character designs feature a portrait of the character in a delta. 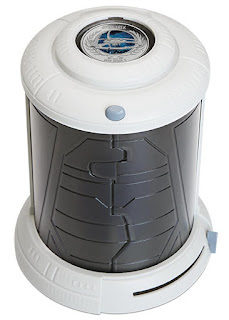 All the paired coins have also been offered in a two-packs, where the two coins are presented in a transporter chamber style case - One coin sits on top, while the over is kept inside, only visible when the chamber is opened. Both positions are illuminated. The box art for these uses a ship schematic in a delta design. 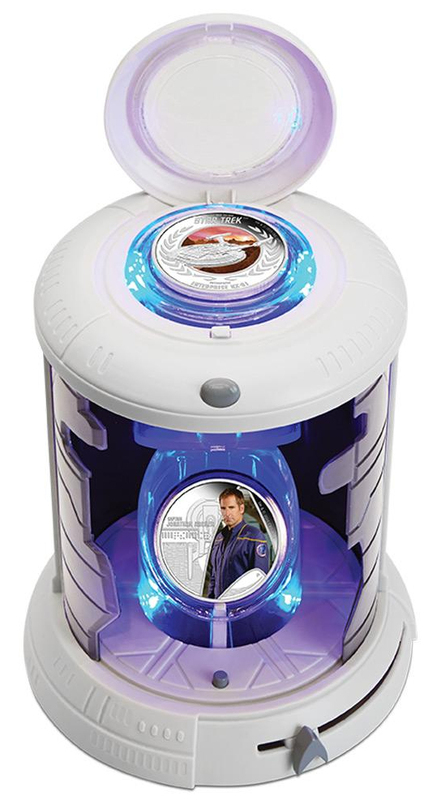 The Discovery two-pack reused the same display design, but recoloured in more Discovery-style metallics, and the outter packaging is branded in the general Discovery style. 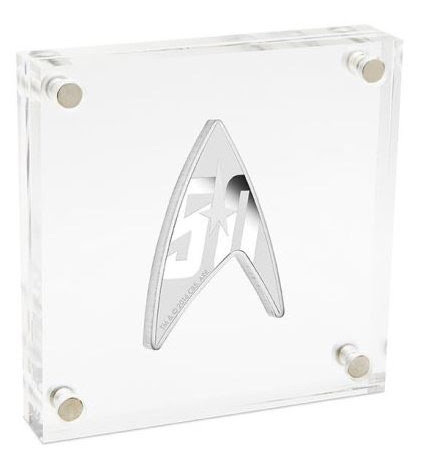 The TOS crew 50th anniversary coin and TOS ships coin came in a communicator display case.